I’m mostly a bike tourist, but I recently looked at how you could apply some bike packing ideas to carry gear on a bike tour. My usual set up is a front Ortlieb handlebar bag and a Carradice Camper saddlebag. I don’t use a backpack as I can fit all my gear and supplies necessary for an extended tour into those two bags. Recently, I realized that my front Ortlieb Classic and my Carradice Camper bags weigh 3.5lbs. I tried to console myself with the thought that a single Arkel touring pannier weighs the same, but it was no good, my bags are one of the heavier items of my touring gear. Now that I tend to tour on a Cervelo RS, my bike and gear weight is 38lbs, so my bags are almost 10% of the weight I carry. Lightweight and ultralight tourers are always looking to save some weight so I wondered if the rackless world of bikepacking could help. The bikepacking approach has a lot in common with my rackless traditional saddlebag set up, but uses lighter nylon stuff sacks. A drawback of these is the difficulty getting at stuff at the bottom of the sack. The traditional saddlebag has a nice big opening making it easy to pack and find stuff. Also bikepacking seems to use an awful lot of bags……. …and the weight quickly starts to add up, even if you do use material that’s lighter than cotton duck. Another consideration is that these bikpacking bags are mostly made by small businesses, so they can be expensive, with a complete set costing several hundred dollars. I wondered if the truly ultralight minded (and budget concious too) could just use a couple of dry sacks strapped to the bike. That would be lighter and less expensive. Tough 20L and 10L compression sacks and some cam straps could carry your gear in a way that’s almost as convenient as a bike packing set up for a fraction of the cost and they’d weigh well under a pound. So here is my attempt at “bikepacking”. Using a 20L eVent Seat to Summit compression sack on the back and the 10L size on the front. The bags are far from full and I have packed my all the gear I just used for a three day tour to Portland; so tent, sleeping pad, sleeping bag, cooking equipment, clothes food etc. The seat pack needs no extra straps. The bag is held against the seat post by the thick fabric band on the bottom of the bag. This needs the seat post to be removed and slipped inside the band….so this is not a quick release bag. Then two of the compression straps are threaded through the saddlebag loops, but the saddle rails would work as well. Some tightening of the straps and it’s very stable. The front takes two cam straps to attach the bag to the handlebars and one compression strap is threaded through the bike frame to stop the bag bouncing up and down. 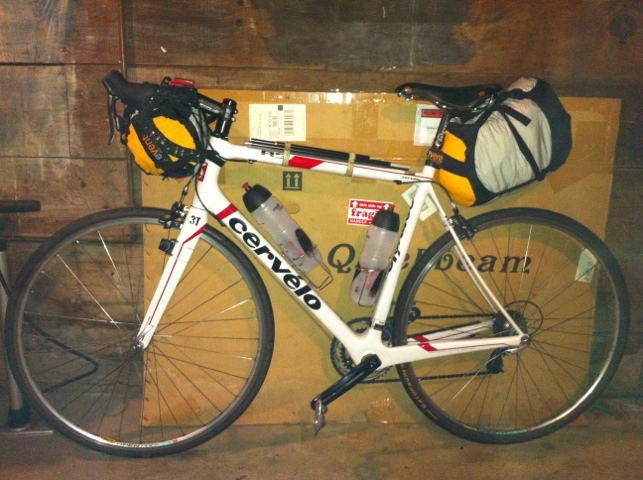 The tent poles are strapped to the top tube in this picture, but they are better carried underneath the front bag. The cost is about $70 and the weight is under a pound reducing my bike and gear weight to around 36lbs. Other bags would be lighter and less expensive, but not as rugged. The set up is not particularly convenient, but it is solid. thank you so much for this!! i want to get into some bikepacking next spring and have been looking at so many options, this looks like a great lower-budget way to accomplish my needs. hopefully it will work well off-road also. Less is more and lighter IS better. Your ideas are right up that alley. Sure you sacrifice convenience for less weight, but on a MTB it is well worth it. Your ideas hit the nail on the head. Cheap, light and FUN. My past BP set up used ond bag that were repurposed and they worked better than well enough. I hope your post helps folks see $$$ shouldn’t be a factor. Creativity, velcro, cinche straps and of course bungie cords can make it happen. If your bike is still a blast to ride, you have done it right, regardless of duct tape and bungie cords. Once your’e hooked the custom bags will seem like a good deal AKA cheap. Thanks for the comments. The addition of a “gas tank” to hold stuff like snacks, wallet and phone would make the set up a bit more practical, but it’s inexpensive and can hold everything you need for unsupported riding. i was also planning on adding a small frame pack and gas tank to the setup. what kind of cam straps did you use to attach to your handlebars? The cam straps are just from REI. FYI, I’d look at reducing your gear volume befor you add too many more bags. A small gas tank would be useful for phone, wallet and snacks etc, but you don’t need to go “bag happy”. perhaps i want to increase my gear volume? How does the rear bag perform off road? Does it bounce around and or rub on the backs of your legs at all while pedaling? Do your handlebars “shimmy” on long, fast descents? I’ve strapped a small compression bag to my road handlebars before and had some scary moments going down some mountain passes! I could’ve been a combination of weight on the handlebars plus an OldManMountain rack twisting out the rear triangle..
Wow. Could you provide a basic gear list? I’m impressed you can carry what you need in such few bags. I must be overdoing the gear, so I would love to see what type of shelter/bag/stove, etc, you use. How sturdy would the compression sack under the saddle be on a mountain bike? I’m doing the Camino de Santiago on the Via de la Plata (Spain) and will be hitting trails and some fairly rough terrain. I wonder if such a set-up could withstand a bit of trail beating. I’ve slotted the handle through the seat post and tightened straps through saddle rails like you suggested in your set-up but I am still getting the rear swing of the bag behind the saddle. Any tips off stopping the rear swing of the bag? Nice. I’ve been using dry bags as a cheap (and very effective) means of biketouring for a couple years now. no zippers, no pesky straps or buttons, just some plain old webbing and tri-clips and it’s all good and very waterproof too. I used a Burton (snowboard company) cylindrical thermos to hold anything with similar shape, like water bottles or fuel and it fit on my top tube. You said ride to Portland. I am in Eugene. Portland, Oregon? I did this in the UK, but got some grease/oil from the seat post on the yellow part of the dry bag (where they both meet when connected). It corroded the waterproof membrane and caused water to enter. It is a great way to do bikepacking – just make sure there’s something between your seatpost and the drysack. Just something to be aware of. And what do you think about to use exped compression bag? It has three horizontal straps to compress and they may be useful to hang it under the saddle (waterproof compression bag at http://www.exped.com/exped/web/exped_homepage_int.nsf); comparing, the Sea to Summit is 210 g for 30 l, the exped is 155 for 36 l.
Since I’m going to visit Ireland on bike tour, I’m wondering about this solution, and I’d like to know your advice concerning this kind of alternative. Coltar’s comment about grease corroding nylon is particularly noteworthy to this fantastic take on economical bikepacking. I’d like to echo BoonesDaddy’s question about your gearlist, though. I’m new to the “bikepacking” world as opposed to traditional touring, and my setups have always relied heavily on racks and panniers, which always end up close to full for my multi-day tours in the mountains of Colorado. There’s no way my sleeping pad would fit in either of those bags, nor would my bag and tent with room for clothes and gear. When I factor in body weight to the total (I’m 6’2″, 130lbs), my lack of gram-counting tends to even out with the average ultralight fanatic (i.e. even if my bike and full load come out to 60lbs, I’m still 10lbs under 200), but I’d like to learn some tips from this community. Excellent idea to attach the compression sack to the saddle – I’ve seen expensive products aimed at bike-packers but this seems to do the job at a fraction of the cost. Much appreciated. just working on a rig for my road bike. Question is – how stable is the bag at the front – how do you attach it to the drop bars? With mountain bikes they anchor it with straps through the top of the fork crown – not enough room on road bikes – any ideas?